What is the Pre-Chat Survey Queue Indicator and How is it Used? The Pre-Chat Survey Queue Indicator gives your organization the ability to include questions in your pre-chat survey that, depending on the answer selected, triggers a corresponding indicator with the conversation when it’s under ‘Waiting in Queue’ and ‘Your conversations’ (found on the main Messaging page). This can be used to aid your volunteers and staff to quickly triage/identify which conversation they should join next based on how the help seeker has answered specific questions set up by your organization. Notice in the screenshot above the text box with some additional information about the help seekers’ concern; this appears when your vols-staff hover their mouse over the indicator and can help them further prioritize which conversation they should join next. 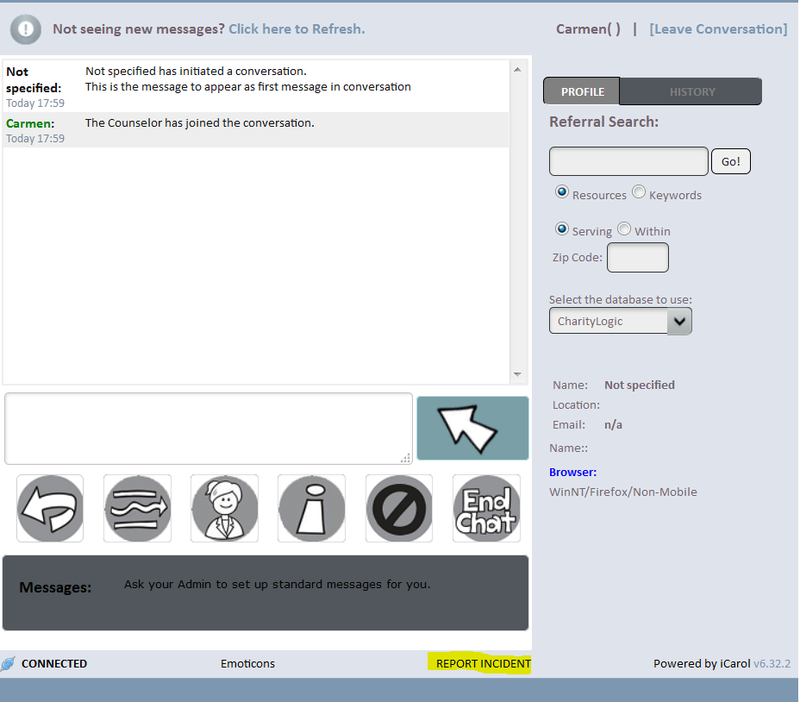 The Pre-Chat Survey Queue Indicator feature is included with all Live Chat Messaging subscriptions. If your organization is interested in finding out more about this feature or wants to get started with the setup, sign in to your iCarol system and click here to read the related help article to learn more. Raise your hand if this scenario sounds familiar: You, and many of your volunteers and staff, agree that you should add new communication channels like live chat or texting to your not-for-profit’s service offerings. But, there’s one big problem—your CEO, Board of Directors, or funders aren’t yet convinced. Perhaps they see your current call volume is healthy or growing, and they mistakenly feel this is a sign that communication by voice call is sufficient, just as in demand as ever, and your community doesn’t need or want these new channels. On the surface that takeaway is understandable, but it’s also wrong. Current call volume is a poor indicator of whether or not people need support through texting/SMS and live chat. Here’s why: If voice calling is the only option to reach you, and you provide needed services over the phone, of course the calls will be there. It’s not about how many people are calling. It’s about who’s not calling. When you only provide emotional support, information and referral, and crisis intervention over the phone, you’re not serving the members of your community who need your services but won’t—or can’t—use the phone to access them. We recently asked an iCarol user how she convinced her board to fund her live chat and texting service, and she said, “I just asked them, ‘Have you ever met a teenager?’” Her point being that teens simply don’t call hotlines, at least not in significant numbers. In fact, this is one area where our clients do report declines in call volume. Many of the organizations we serve report that people under age 25 are their smallest represented demographic. Of course, we know youth aren’t free of interpersonal crisis, financial troubles, food insecurity, abuse, suicide ideation, and any number of serious issues. In fact, we know that for many of these issues, youth are desperately in need of outreach and support. 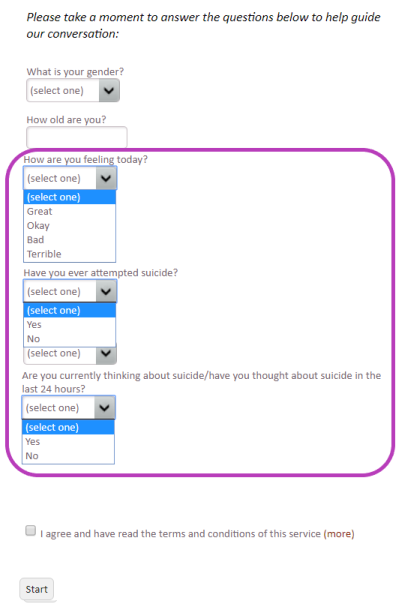 According to the CDC, suicide is the second leading cause of death during adolescence through young adulthood. Girls and young women between the ages of 16 and 24 experience the highest rate of intimate partner violence—almost triple the national average, according to a study by the US Department of Justice. According to the National Alliance on Mental Illness, of the 1 in 5 people living with a mental health condition, half developed the condition by age 14 and 75% by age 24. Taking that first step to ask for help or advice is tough for anyone. But for teens, expecting that first contact to come in the form of a phone call is even harder. People under 25 are digital natives, meaning they grew up with communication technology like live chat, texting, social media, and other chat apps. Use of these mediums comes naturally to them while voice calling may feel more awkward and less convenient, unnatural even. A 2015 study by the Pew Research Center on teens, technology, and friendships found that teens reserve phone calls for their closest friends, while they prefer building new friendships over text messaging. It takes a level of established trust and familiarity for them to talk over the phone with someone. So, think of your helpline as a new friend. It’s less likely that a young person will dial the phone to talk about a problem or sensitive issue with you, but they may be willing to text you or chat with you. Unfortunately, no matter how common and normal someone’s personal struggle may be, they may feel embarrassed or ashamed about it. There is an enormous effort across many different industries—suicide prevention, mental health, intimate partner or sexual violence to name a few—focused on removing the stigma and societal judgment associated with these issues. While those efforts are certainly helping, shame remains a barrier to getting help for many people in need of assistance. They may have a tough time saying aloud what they’re going through. They may be afraid that someone will overhear the conversation. Think of a LGBTQIA teen who is working through their identity and struggling with how or when to come out to friends or family. They may be very averse to making a phone call that could easily be overheard by parents, siblings, or friends. Or, consider a young woman who has recently been raped or sexually assaulted by someone she knew and thought she could trust. She could be feeling shocked, betrayed, and may even be blaming herself. In these and other scenarios, the person is likely feeling scared and vulnerable, and being able to type about it privately, silently, and anonymously with a caring and confidential source may be much more appealing than making a call. Sometimes the need for silent communication isn’t so much about preference as it is about self-preservation. Voice communication could actually prove dangerous in certain situations. A few years ago there was a very powerful ad shown during the Superbowl by the group NO MORE. The ad featured shots of the interior of a home in disarray, with items knocked over and strewn on the floor. As we see these visuals we hear a recorded 9-1-1 call between a woman and an operator, though oddly the woman is trying to order a pizza. At first confused and taken aback, the 9-1-1 operator realizes that the woman’s “pizza” call is a ploy to foil an abusive partner because she is unable to call out for help but needs an officer to visit the home. You can watch the ad here. The ad reminds us of the importance of silent communication for the purposes of safety in certain scenarios, and even 9-1-1 and other emergency centers are responding by text-enabling their services. Not all situations are as dire as the one shown in the ad where there is an active, life-threatening attack. While some may need a silent way to request active rescue, others may need to reach out to discretely chat or exchange SMS messages about their abuse to receive emotional support and empowerment without their abuser overhearing, which could escalate the situation and cause harm. When providing a community service, it’s important to be inclusive and mindful of the needs of different groups and cultures and mitigate potential access barriers. The Deaf community and people with disabilities in particular can become isolated from essential services when their needs aren’t accommodated. 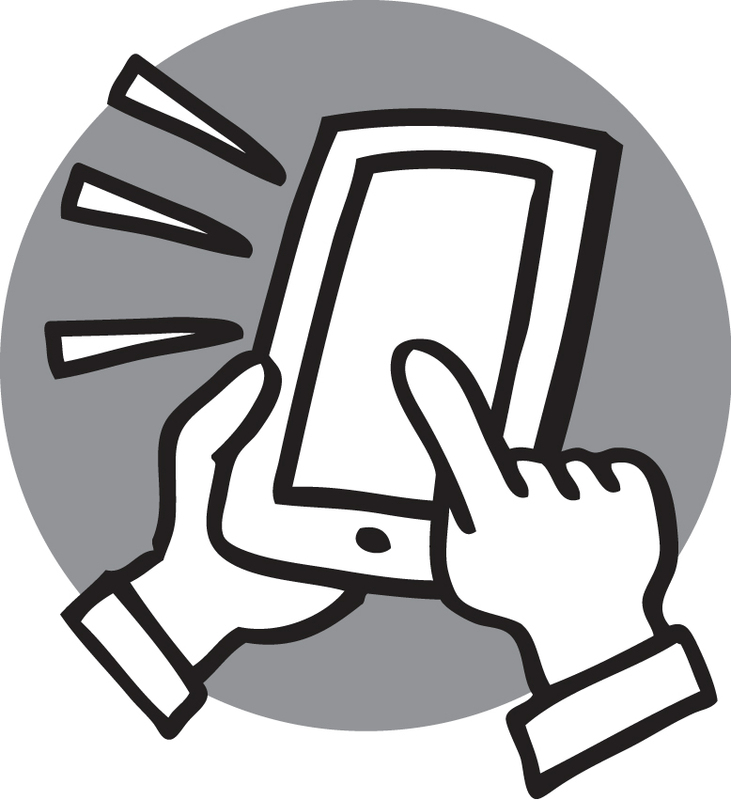 Offering assistance through live chat and texting can ease the path for people who are disabled or deaf. When someone has a disability affecting their speech in some way, verbal communication can not only be less therapeutic, but it can add frustration to their situation. However, they may find written communication a viable alternative. And, while there are interpretation services such as video relay available to the Deaf community, many would prefer to communicate directly with a helpline counselor without a third party present, especially when discussing sensitive or private issues. Written communication directly between the deaf person and an organization’s volunteer or staff member may help them feel more connected with the agency and, by extension, any plans, referrals, or problem-solving strategies they arrived at with the specialist’s help. Adding new communication channels to your service offerings requires a culture shift and open mind among leadership, program managers, and frontline staff alike. While there are some who need convincing, we hope by now the evidence is clear: Use of communication channels like chat or SMS/texting is not a passing fad. They have become widely adopted, permanent fixtures in our society. Offering these service alternatives is not just smart business practice needed to remain relevant, but a vital form of outreach to populations that find themselves cut off from needed services only offered on traditional channels. Are you concerned that the volume of Chat or Text traffic coming through to your service is lower than you were expecting it would be? Or, are you in the planning stages of adding a Chat or Text service to your center and want to develop a plan for alerting the community to this new way to access your program? Join us on Monday, April 9 at 2pm EDT for a Q&A webinar with a panel of staff members operating successful Chat and Text programs to hear about how they communicated their service offerings to their communities. Can’t make it? Fear not! We’ll have the recording available to watch at your convenience. Have you been considering adding on popular and in-demand communication channels like Live Chat or Texting to your organization’s services? Are you curious to see how these channels are handled in iCarol, and how they fit seamlessly into the rest of the functions of the software? I hope you’ll join my teammate Mary and I for a live demo on Thursday at 2pm EDT so we can show you! To find out more about this webinar and what we’ll cover, visit our registration page. For more information about the enhancements, please refer to the Help page in iCarol, by clicking Help in the left hand menu. There are two documents and a training webinar available in the “New” section of the Help page with information about the enhancements. It is our goal to upgrade all clients to the new version of the Contact Form and Messaging by the end of 2017. Therefore, this upgrade is mandatory, and all clients will be upgraded. 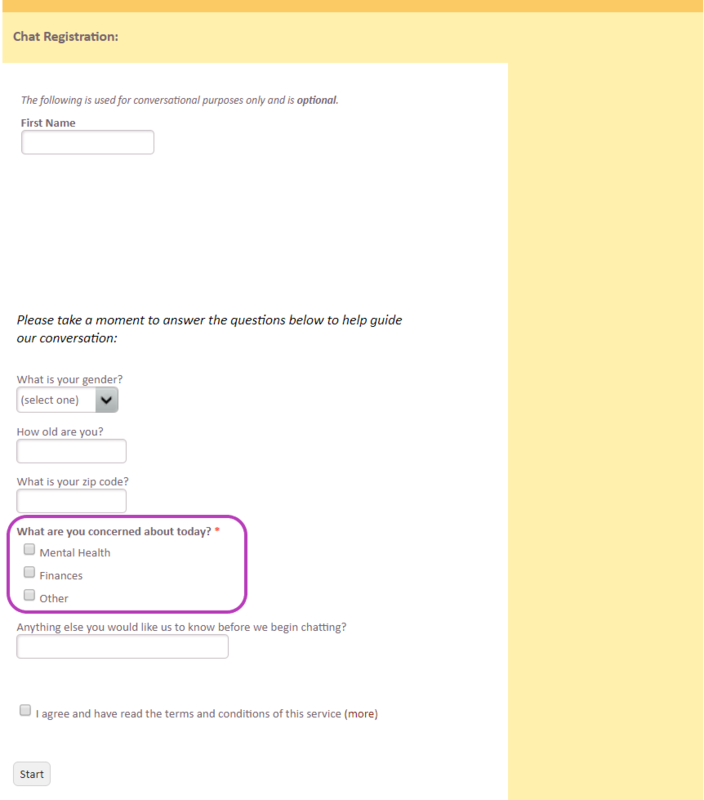 We began this work by sending out a survey to iCarol Admins which asked which quarter they would like to be upgraded in. We used the responses to this survey to begin scheduling clients for the upgrade. Those who did not respond to the survey have also been scheduled for the upgrade. The timing of the upgrade for each client is based on the features they are using in their Contact Forms. Not all features are available in the new version of the Contact Form yet, but these features will be added throughout the year. iCarol staff will be in close communication with clients who are being upgraded, and will provide all the information needed to successfully complete the upgrade. Timely responses from clients throughout the upgrade process would be greatly appreciated so the upgrade can proceed in an efficient and effective manner. Clients will be informed of when the upgrade will occur, and if the timing does not work for them, they can request to be rescheduled for a later date. Please be aware, we will do our best to re-schedule clients to a time they request, but we cannot guarantee this. We must balance the requests with the availability of iCarol staff to complete the upgrade. 1. During each month in 2017, iCarol will send an email to all clients scheduled to be upgraded the next month. 2. A case will be created by iCarol staff to track the upgrade process. 4. A member of the iCarol Support team will add demo forms to the client system. These demo forms will be copies of the client’s Contact Forms, upgraded to the new version of the Contact Forms. 5. A member of the iCarol Support team will respond to the case when the demo forms are added. 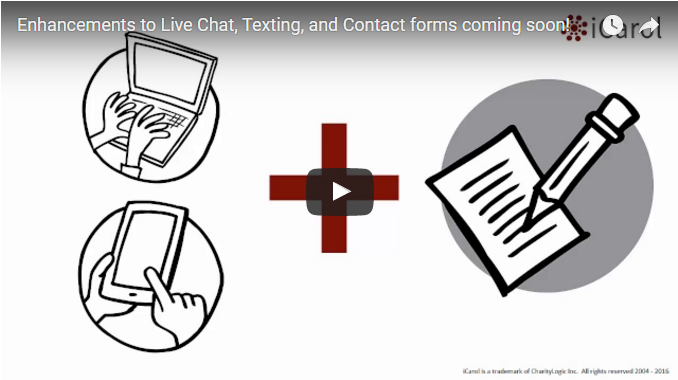 The demo forms will allow clients to preview and play with the new version of the Contact Forms prior to completing the upgrade. They can also be used to train staff and volunteers on the new version of the Contact Form. 6. A week prior to the upgrade week, a member of the iCarol Support Team will respond to the case with the exact date the upgrade will be completed. 7. On the day of the upgrade, the upgrade will be completed, and the demo forms will be deleted. A member of the iCarol Support team will respond to the case to indicate the upgrade is complete. If there were Contact Forms not eligible to be upgraded, iCarol staff will reach out later in the year to schedule the upgrade of these forms. 1. During each month in 2017, iCarol will send an email to all clients scheduled to be upgraded the next month. d.	Specific questions that the client will need to answer so the iCarol Support team member can begin setting up Messaging portals. Please note, the process cannot continue until these questions are answered, so it is very important that a timely response be sent. 4. Once the answers to the specific questions noted above are received, the iCarol Support team member will begin to set-up Messaging portals in the client system. Once completed, they will respond to the case with instructions on the next step in the process which the client will need to take, which is to assign Vols-Staff member to Portal Programs. 5. Client assigns Vols-Staff to Portal Programs, and responds to the case to let the iCarol Support team member know they have completed the task. Again, the process cannot proceed until the iCarol Support team member receives confirmation that this task is complete. 6. Once confirmation of the task outlined above has been received, the iCarol Support team member will complete the set-up of Messaging portals. This response will also include which week the upgrade process will be completed in, and information about adding demo forms to the client system. 8. A member of the iCarol Support team will add demo forms to the client system. These demo forms will be copies of the client’s Contact Forms, upgraded to the new version of the Contact Form. 9. A member of the iCarol Support team will respond to the case when the demo forms are added. The demo forms will allow clients to preview and play with the new version of the Contact Form prior to completing the upgrade. They can also be used to train staff and volunteers on the new version of the Contact Form. If there are Contact Forms that are ineligible to be upgraded at this time, these will be noted in this response. 10. A week prior to the upgrade week, a member of the iCarol Support Team will respond to the case with the exact date the upgrade will be completed. 11. On the day of the upgrade, the upgrade will be completed, and the demo forms will be deleted. A member of the iCarol Support team will respond to the case to indicate the upgrade is complete. If there were Contact Forms not eligible to be upgraded, iCarol staff will reach out later in the year to schedule the upgrade of these forms. If there are any questions about the upgrade process, please feel free to submit a case to the iCarol Support Team via the online case management system, accessed by clicking Help in the left hand menu in your iCarol system. 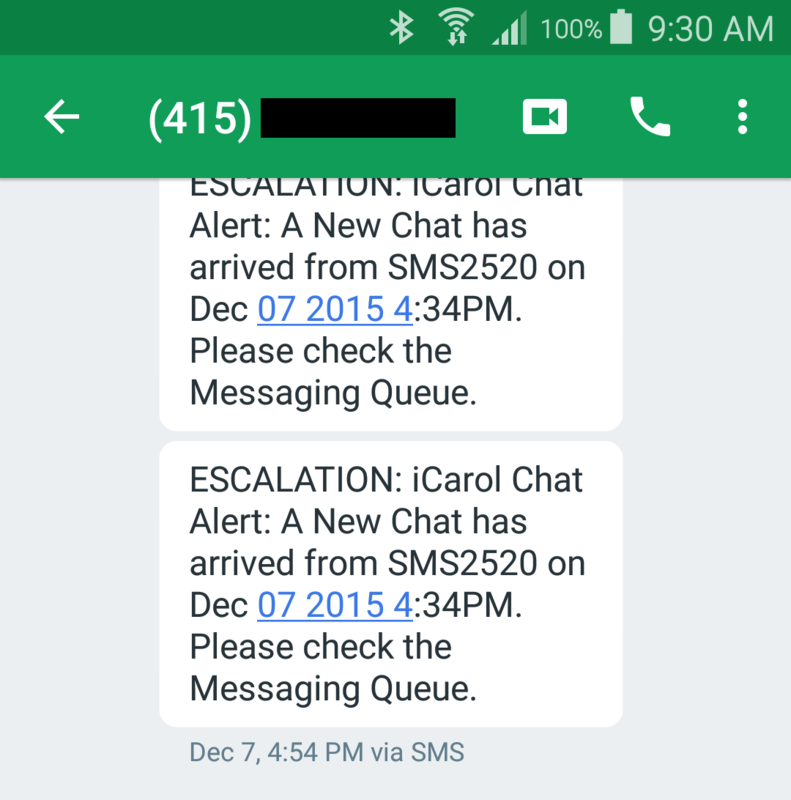 In response to the increased use of alternate communication channels for help seekers, many iCarol clients are adding Messaging to their iCarol systems. Using Messaging, you can communicate with your help seekers via chat or text. As with other areas of iCarol, sometimes issues can arise that require making a report to the iCarol Support Team. The preferred method to communicate with the iCarol Support Team is to submit a case via the Online Case Management Tool. Please click here for more information on how to submit a case. When the issue is in regards to iCarol Messaging however, there is another tool that we encourage you to use to report issues with this area of iCarol. This tool is called the Report Incident Tool and is found at the bottom of the counselor’s screen when addressing a Messaging conversation. Any user can us this tool to report an issue. When one clicks Report Incident, a small form will appear in a pop-up window. Please enter a concise Subject that describes the issue, and then use the Description text box to further describe the issue in as much detail as possible. Once the security code is entered, and the “Report Incident” button clicked, a case will be created and sent to the iCarol Support Team. This case will also appear in the Online Case Management tool. All cases created in this manner are named “Messaging Incident #xxxx: Subject”. 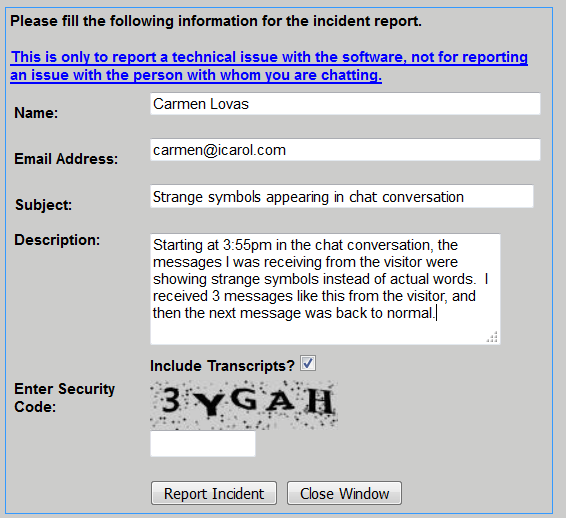 For example, the name of the incident shown in the screenshot above might be “Messaging Incident #2650: Strange symbols appearing in chat conversation”. The case will be appropriately attributed to your agency. The first available member of the iCarol Support team will respond to the case and begin the investigation of the issue. The benefit of submitting Messaging cases in this manner is that this tool conveys additional details about the specific Messaging conversation the user was addressing that helps the iCarol Support and Technical teams immensely when investigating issues. Some of the details conveyed include browsers being used, platforms being used, and whether the visitor was using a mobile device. The details can be extremely helpful in investigating and ultimately resolving an issue. This quick and easy to use tool can be a benefit to you by conveying details “in the moment” so they are not forgotten. It can cut down or eliminate conversations or emails between the user who experienced the issue and an Admin user who wants to report the issue to iCarol Support. It can also mean that issues are reported faster, which could lead to faster investigation and resolution of the issue. As always, if you have any questions about the Report Incident tool, or anything else, please do not hesitate to contact the iCarol Support team! We’re getting ever so close to releasing the powerful enhancements to your Call Report Forms and Live Chat and Texting features in iCarol. Take a few minutes to watch our new video! More than a decade ago when iCarol was first created by two helpline volunteers, Neil and Jackie McKechnie, helpline work was very much based in serving people via the phone. And the phone remains a method of communication to this day for helplines all over the world. Over the years though, as new technologies grew in popularity and availability, people increasingly turn to channels like chatting, texting, or connecting with services through websites. And helplines need to embrace these new channels to stay relevant and reach more people. 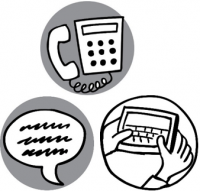 The flexibility in iCarol enables helplines to capture important information regardless of the type of contact — our Call Report Forms are used to collect data on interactions, whether they happen over the phone, online, via text, or even at in-person visits from mobile crisis teams or walk-in clinics. But some of the verbiage inside iCarol still centers around calls as a primary service, like the main Calls page, Call reports, and Caller Profiles. We know that many helplines have expanded services beyond the phone, and that iCarol plays an important role in your documentation of all channels. For that reason, we are considering a name change for the “Calls” section of iCarol to better describe what you do and how you use these features. Please take 2 minutes to give your input about this by taking a brief survey. Ontario Online and Text Crisis Services program (ONTX) recently marked a year of service to their communities, and shared data with constituents in their latest newsletter. In the report they describe response to the program as “overwhelmingly positive” while allowing contact with many individuals who otherwise would not have reached out for help. For a full look at the released findings click here, or read a summary here. Want future updates from ONTX and other services of DC Ontario? Be sure to sign up for Distress and Crisis Ontario’s newsletter by emailing your request to . We’re thrilled by the success of our friends at ONTX, though it comes as no surprise to us that they’ve had this response. The caring people at the Distress and Crisis Ontario have been providing listening support and crisis intervention to Ontario for nearly 50 years. Their latest step to make their services available in a way that works for everyone in need demonstrates their commitment to helping people and saving lives. One of the great things about Messaging with iCarol is the inclusion of notifications to tell you when a help seeker is waiting to have a chat or texting session with you. Historically these notifications arrive on your computer screen where you’re signed in to iCarol, and you can then promptly assume that new conversation. This ensures that visitors are promptly attended to, helpling them feel heard and cared for. The drawback to this is, your volunteers and staff can’t always be at their workstation for the entire duration of their shift. They may have work that takes them to places other than the call center, whether that’s down the hallway or across town. Perhaps, like many agencies, your overnight shifts are sleep shifts with staff permitted to sleep or at least doze, either in the office or at their homes, with the understanding that they need to be awake and alert at a moment’s notice. In these and other scenarios, receiving those notifications only at your workstation computer presents a challenge. But now there’s an additional option available: your chat specialists can receive text message alerts to their mobile phone when a new conversation arrives. In a system update scheduled to occur today, our Messaging users will be able to set up these notifications to be sent to their volunteers and staff via text message. And to add an additional layer of protection, supervisors or on-call staff can receive escalations if the incoming conversations aren’t assumed promptly. This feature will be available to all Messaging users who host and control their Messaging service, at no additional subscription cost, though it’s important to note that each sent alert will count towards the bundle of texts purchased for that month. 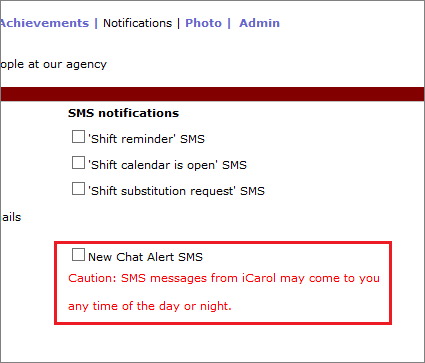 Admin users will need to turn on these mobile alerts and set it up to your specifications. At first this functionality will only be available to our North American clients, but rest assured we are working diligently to bring these same tools to our clients elsewhere in the world as soon as possible. We can also offer this enhancement just to users who host and control their Messaging services, i.e. at this time messaging services which are part of bigger collaboratives that you participate in or share coverage of, where you do not control the messaging settings, are not eligible for the mobile alerts feature. We know how useful and helpful these alerts are, and so we’re working hard to expand the coverage of this tool for an even wider range of iCarol users. 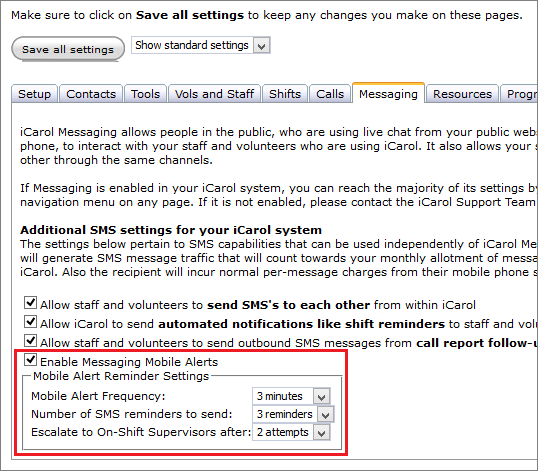 You must first enable system SMS messages by clicking the settings “Allow staff and volunteers to send SMS’s to each other from within iCarol” and “Allow iCarol to send automated notifications like shift reminders to staff and volunteers who have enabled this in their profile.” If you were not previously using SMS notifications, please note that using Mobile Alerts may result in nominal monthly increases to your iCarol subscription. Please contact our support team if you’d like to learn more before enabling these notifications. Next, click on “Enable Messaging Mobile Alerts”. Enabling this setting will send a “New Chat” SMS to volunteers signed up for messaging shifts at the time the conversation is started. 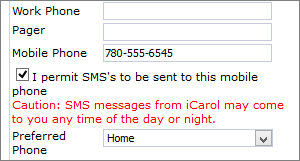 Mobile Alert Frequency: This setting identifies how much time will pass between SMS reminders. Options range from “never” to 30 minutes. Number of SMS reminders to send: This setting identifies how many SMS reminders will be sent after the New Chat SMS notification. Reminders are sent to all volunteers signed up for Normal Messaging Shifts. Options range from “never” to 5 reminders. Escalate to On-Shift Supervisor after: This setting identifies at what point the On Call/Support worker will be notified of the waiting conversation. Options range from “never” to 5 attempts. To get an idea about how these settings affect the total number of alerts that are sent, as well as the total wait time a visitor might experience based on those alerts (should the volunteer or staff person not respond immediately), please review the chart below. Volunteers and Staff are encouraged to enable the SMS Mobile Alerts setting on their profiles themselves, so they can be sure they understand and authorize these alerts, and then accept the agreement to receive SMS messages to their mobile phones. They must permit SMS messages to be sent to their phone or else they will not receive the mobile alerts of new conversations while on shift. Anyone can confirm that Messaging Mobile Alerts is fully configured by signing on to iCarol, clicking on the Messaging page from the left menu and looking for the “You have Messaging Mobile Alerts configured. Rest assured, if a chat comes in, we will notify you” message at the top of the page. 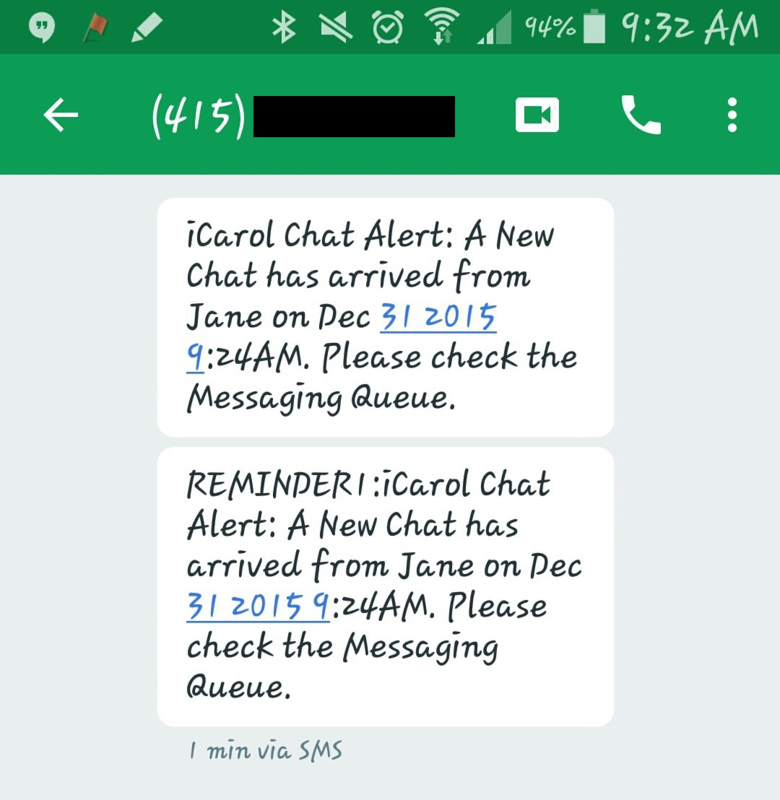 In order for the SMS Mobile Alerts feature to function, volunteers must be signed up for a Messaging shift at the time the IM/SMS conversation is started. During the setup of your shifts you will be able to specify “Normal Shifts” and “On call/Support Worker” shift types. All volunteers signed up for normal messaging shifts at the time the new conversation is started will receive the New Chat notification, and sequential reminders. All workers signed up for On Call/Support Worker shifts, even if these shifts are not specifically messaging shifts will receive escalations. Our hope is that this additional option for notifying your volunteers of newly arriving conversations will help you provide a high quality, prompt response to your community. We realize that when adding new channels to your service, you’re often asking volunteers to multi-task and provide both your traditional and alternative services simultaneously. Rest assured that in spite of this multi-tasking and wherever their shift duties may take them, these alerts will assist in consistent, complete service delivery. We also hope these new notifications will help with staffing and service hour decisions. Overnight staff can be better notified of these conversations even if they are not at their workstation, in the event your agency allows sleeping shifts overnight. Additionally, if you are unsure of the best hours in which to provide your new chat or text service, and you want to keep your service open 24/7 for a time to gauge peak service times, these alerts will better help you maintain that ’round the clock coverage, especially if staff are to go about their normal business or even be at their homes for part or all of that period. These mobile alerts will allow new services to keep the service open for extended hours, without needing a person to be tethered to their workstation for that entire period. If you have any additional questions about this feature, we invite you to reach out to our Support Team.